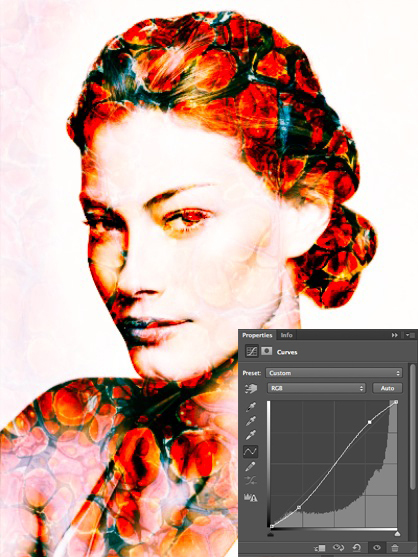 Understanding the mathematics behind the Blend Modes can be useful, but it’s not essential. In this tutorial you’ll learn how to use Blend Modes to transform a portrait with a couple of fantastic images of marbleized paper. Success here relies on a combination of selection and masking skills. We’ll show you how to use the Channels Panel to quickly load intricate selections of an image’s luminosity. then use the selection to create a series of masks and colour fills. We’ll also use a variety of Curves layers to control the tones, both globally and selectively, then make use of the High Pass filter to emphasise the detail in the face. lt may sound complicated, but in reality it’s surprisingly simple. 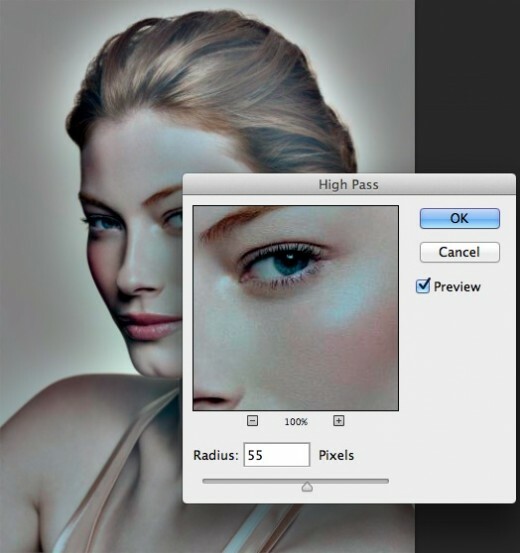 It’s an effect that works on any close-up portrait, so go ahead and try it on one of your own. Open portrait into Photoshop, then go to the Layers Panel (Window> Layers) and click the Create New Layer icon at the bottom. Next, go to Edit> Fill, choose Use: White and hit OK to fill the layer with white. Click the eye icon to hide the layer for now. 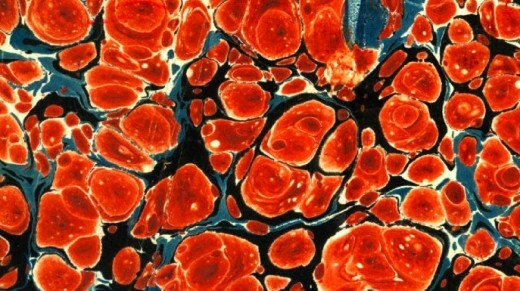 Open Red Paper Marbleized image into Photoshop, then grab the Move tool. Go to the Options bar and make sure Auto Select: Layer and Show Transform Controls are ticked. 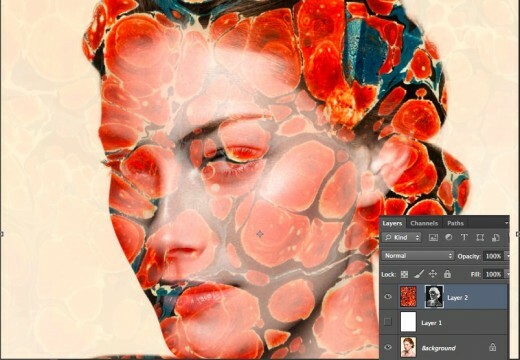 Click and drag the marbled paint image up to the tab of the portrait image, then down into the image to copy over the paint layer. Use the Move tool to position the new paint layer, then click the eye icon to hide it. Next, go to Window>Channels to access the Channels Panel, then hold down Cmd/Ctrl and click on the RGB channel to load the luminosity of the image as a selection. Go to invert the selection so that all the darker areas are selected. 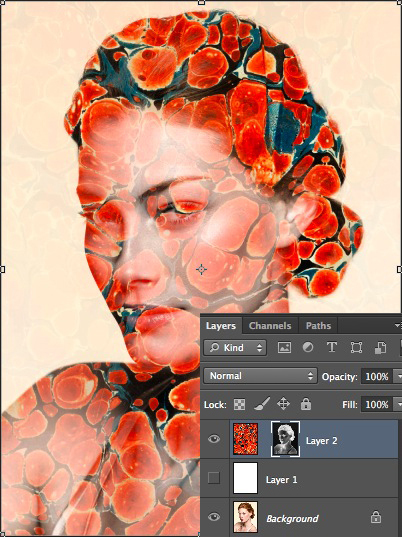 Reveal the top two layers in the Layers Panel, then highlight the top paint layer and click the Add Layer Mask icon at the bottom of the Layers Panel to convert the selection to a Layer Mask. If you’d like to fine-tune the positioning of the paint, click the link in the Layers Panel that connects the image thumbnail to the mask thumbnail. Now you can move the image or mask independently of one another. Highlight the image thumbnail and use the Move tool to drag the image around. 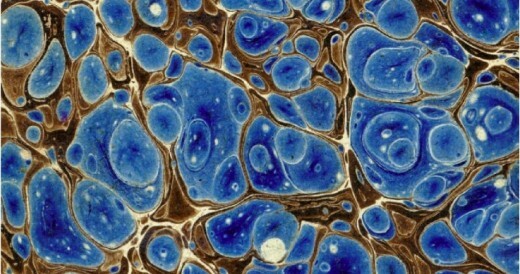 Open blue Paper Marbleized, then use the Move tool to drag it into the portrait image (as in Step 2). We want to add the same Layer Mask to the new paint layer. We can do this quickly by holding down Alt and dragging the Layer Mask thumbnail from the lower paint layer onto the new paint layer. 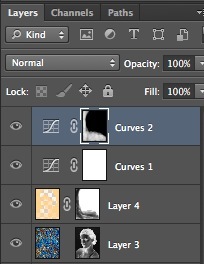 Highlight the newly added paint layer, then click the Blend Mode drop-down menu at the top of the Layers Panel. Experiment with the Blend Modes using your mouse wheel to cycle through them. We’ve used the Subtract Blend Mode here, but feel free to choose an alternative if you prefer. Hold Cmd/Ctrl and click one of the Layer Mask thumbnails to load the shadows as a selection again, then go to SeIect > Inverse to target the highlights. 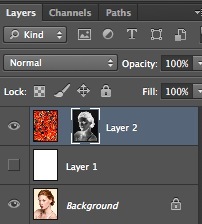 Next, add a new empty layer at the top of the Layer Stack. 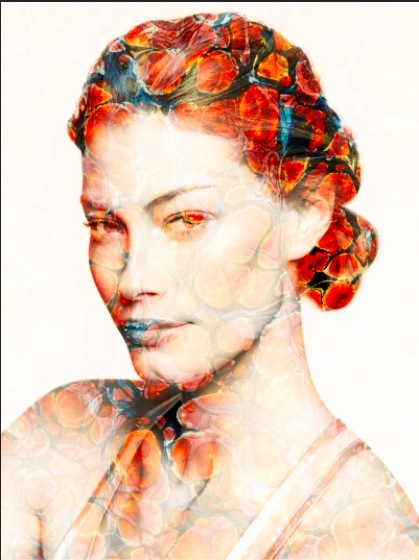 Grab the Brush tool, hold down Alt and click to sample a light yellow tone from the image. Press Alt+Backspace to fill the selection with yellow. Press Cmd/Ctrl+D to deselect, then change the Blend Mode to Screen. The bottom and left-hand sides of the image are looking a little too bright now, so click the Add Layer Mask icon, choose a soft-edged circular brush tip, press D to set the foreground colour to black and press 3 to set 30% brush opacity. Paint over the bottom and left-hand side to mask the layer and reveal the darker tones underneath. Click the Create Adjustment Layer icon at the bottom of the layers Panel and choose Curves, then make a shallow S-shaped curve by dragging one point down near the bottom of the line, and a second point up towards the top of the line. 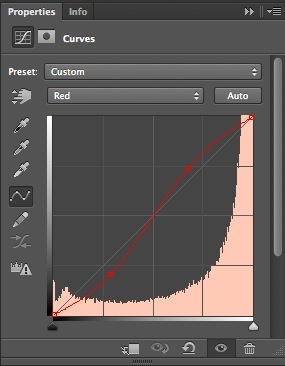 Add a second Curves Adjustment Layer and drag the Curve line downwards to darken the image. Press Cmd/CtrI+I to invert the mask on the Curves layer to black, then grab the Brush tool, set the foreground colour to white, and paint over the bottom left of the image. 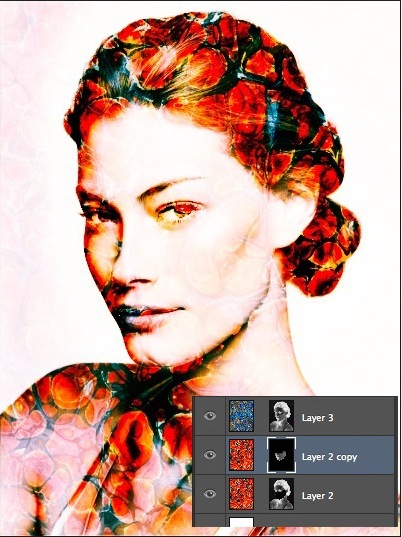 Highlight the portrait on the Background layer, then press Cmd/Ctrl+J to make a copy. Drag the copy to the top of the Layer Stack then go to FiIter>Other>High Pass. Set Radius 55px and hit OK. Change the Blend Mode of the layer to Overlay. Add another Curves Adjustment Layer and plot an S-curve to add even more punch, then click the RGB drop- down menu at the top of the Curves settings and choose Red. Plot a shallow S-shape on the Red curve line to add red highlights and cyan shadows, then go to the Blue curve line and plot a similar S-shape to add Blue highlights and yellow shadows. Hold down Alt and click the Create New Layer icon, then in the New Layer box name the layer Dodge Burn, set Mode: Overlay and check Fill with Overlay-neutral color (50% gray). 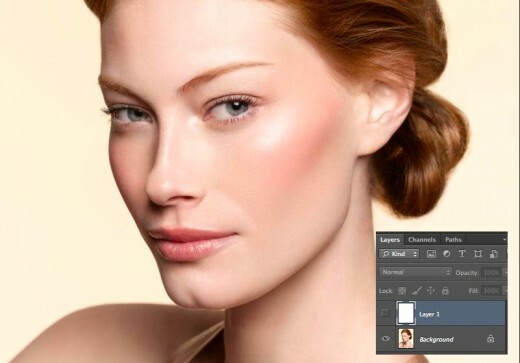 Use the Dodge and Burn tools (with both set to Range: Midtones, Exposure 20%) to darken the jaw line and lighten the eyes. Highlight the Background layer then hold down Alt and click the Eye icon next to it to hide the others. Grab the Quick Selection tool and paint with it to select the chin and lower half of the face, up to the eyes. Go to Select> Refine Edge. Set Radius 2.3, Smooth 9, Output to: Selection and hit OK.
Click the Eye icons to reveal all the other layers. Drag the lower marbled paint layer to the Create New Layer icon to copy it. Highlight the bottommost layer mask thumbnail then set black as the foreground colour and hit Alt+Backspace to fill the selection. Next, go to Select> Inverse then highlight the mask on the new copy and again hit Alt+Backspace. Press Cmd/Ctrl+D to deselect.